Plymouth Argyle's chief executive Martin Starnes says he is frustrated by delays to the building of a new grandstand which he says are "critical" to the future of the football club. But despite no work has started on the site. "The grandstand is absolutely critical to the future of this club," he said. "We need that to generate additional revenue which we can then put into the team and improve the budget and playing standards that we've already got here," added the former Yeovil chief executive, who joined Argyle in July last year. Under the plans Argyle will replace their antiquated Mayflower Stand with a new 4,800-seat facility. "It is frustrating, you can't deny that, because at the beginning of the season we expected work to be underway," Starnes said. "Unfortunately with complex developments like this, they're not always straightforward and you do get hurdles to overcome. 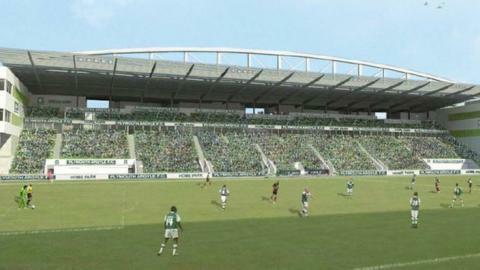 "Without the Higher Home Park development we haven't got a grandstand, it's as simple as that. "It's the development of the rest of the site which is providing the funding to give the club a grandstand." Argyle went into administration in March 2011 and were relegated to League Two two months later. Brent as the club just missed out on being relegated to the Conference, and has since unveiled his plans to redevelop the Higher Home Park area. "There's still work going on behind the scenes with the development team," added Starnes. "There are several issues which are holding things up; the contractors, sub-contractors, the budget costs for the grandstand and those sort of things are all relevant."